As the Justice and Development Party (AKP) and the Republican People’s Party (CHP) have intensified exploratory talks for building a coalition government in their third meeting, top themes and subthemes emerged on which the two sides are examining comparatively, namely democracy, economy and foreign policy. The two delegations met July 28 in their third meeting under the leadership of Haluk Koç from the CHP and Ömer Çelik from the AKP. The delegations are expected to meet every day until the end of this week before submitting a general report to the two chairmen. New constitution: Given that the total seats of the two parties suffice to amend the constitution without the need of referendum, the AKP underlines its demand for “libertarian constitution based on equal and free citizenship.” The joining of AKP deputy Osman Can, an expert on constitutional law, to the delegation is an indication of this intention. The CHP has agreed to the renewal of the constitution, on the condition that it will be adopted as a result of a parliamentary compromise. Kurdish question: Despite ongoing military campaign against the Kurdistan Workers’ Party (PKK) camps in the northern Iraq, the AKP is in favor of the continuation of the Kurdish peace process. The social democrat party is not against the Kurdish peace process but has serious questions over its methodology. The CHP’s demands its continuation under the parliament roof. The two parties are also on the same page for reducing the 10 percent national election threshold. Human rights and freedoms: In theory, the two parties do not disagree too much on these issues. But the CHP has serious criticisms over the Home Security Package, which was adopted just before the June 7 polls. Although the main opposition party believes that fundamental rights such as right to assembly, protest and freedom of expression have been violated, it will have no objection if these issues will be addressed in a protocol. Judiciary: One of the issues on the table on July 28 was judiciary. The CHP is of the opinion that judiciary has already lost its independence. Although the AKP does not share this view, it accepts that the judiciary has lost its credibility and reputation in the eyes of the people. One other common point between the two parties is the need of re-structuring the Judges and Prosecutors’ Supreme Board (HSYK). Parliamentary system: The AKP’S election manifesto promises the adoption of a presidential system. Prime Minister Ahmet Davutoğlu emphasized they would consider adopting the system through a new constitution. But the CHP is determined to keep the parliamentary system and wants constitutional amendments to remove vague points about the president’s powers in the current charter. The much-controversial status of the president will also be on the agenda of the two parties as the CHP wants the imposition of customs and traditions in the appointment process of senior bureaucrats. The AKP also accepts that such appointments should be made within the knowledge and consent of the coalition partner. Central Bank: Both parties agree on the need of maintaining the independence of the Central Bank. Similar lines have been taken on issues concerning interest rates, inflation and growth. Financial policies: The AKP finds the CHP’s promises to increase minimum wage and exempt farmers from paying taxes for the gas they use as groundless and populist. The CHP’s promise of two bonus salaries for the retired may not be put into practice, either. Social state: There is agreement on the two parties’ approaches and projects. There are minor points of disagreement about the methodology in the implementation of these projects. Fight against corruption: Both parties’ lines about the fight against corruption and transparency are similar. The corruption cases on four former ministers should be debated at the parliament, the CHP believes. The AKP, however, believes the issue should be closed, as the next government will actively fight against corruption. Foreign: The AKP and the CHP’s views on the Cyprus issue and Turkey’s EU process overlap. 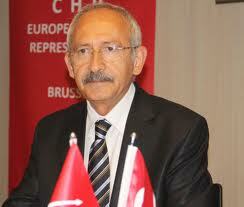 However, foreign policy stands one of the most difficult issues for compromise, as CHP leader Kemal Kılıçdaroğlu insists on an overall re-calibration of the country’s policy towards the Middle East. Turkey’s declaration of “war” on the Islamic State of Iraq and the Levant (ISIL) is a positive development for the CHP but Davutoğlu’s labeling of his Syria policy as a “legend” and signaling no change in ties with Egypt, Israel and other regional countries worries the CHP. The two delegations are expected to intensify talks until the end of July and submit a general report outlining the positions of the two sides to their leaders before Aug. 3, the day the Supreme Military Council (YAŞ) meets. The issues on the fight against the corruption, strengthening parliamentary democracy, financial policies and foreign policy are expected to be negotiated at the leaders’ level. In addition to these, the distribution of ministries will also be decided by leaders Kılıçdaroğlu and Davutoğlu. In the meantime, there are unconfirmed reports about a secret meeting between the two leaders to reconcile on some of the disputed issues.